It is very important to have our blog social on social networking sites. Social networking site drives huge traffic to the blog. Here I am with a code to add a Facebook Widget to the blog. Facebook page free here and follow following steps to add Facebook widget to your blog. 1) Go to your Blogger Dashboard. 2) Click on Layout Menu. 3) In your sidebar region, click on Add widget box. 5) Paste the following code to the content area and save it with empty title. 6) You have completed your job 80 % successfully. Now you are just 3 steps away to be get Facebook like button widget install on your blog. 7) Now click again on Add widget box. 8) Paste the following code to the content area with replacing with your Facebook page name. 9) Give it your own title as "Facebook Voice" or "Like Us On Facebook". 11) Now click on Save Arrangement. That's it you have done it.. 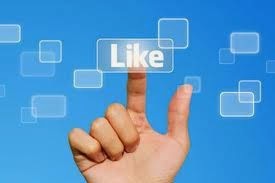 Here was a post about to add Facebook like button to your blog. If you like this post kindly share your comments, feedback as well as suggestions with us. Thanks for providing the code..I was actually having a hard time looking for codes like this one..Im actually doing a blog about atlanta hosting.